If I could take home one object from the ‘Jewel’ exhibition at the Sadberk Hanım Museum, well, I don’t think I could choose just one. The writer in me covets the 19th-century writing box made of wood and tortoiseshell with silver and enamel embellishments. But then there’s the 17th-century jade spoon whose handle is decorated with silver, coral and a chevron pattern made of ivory and ebony – eating my morning yogurt with such a spoon would be pure decadence. The diamond-and turquoise-encrusted silver coffee cup holders (pictured above) would dazzle guests, camouflaging my below-par Turkish coffee-making skills. Suffice to say that this exhibition had me lusting after a life of luxury. It’s no surprise that I was having dreams of grandeur. The objects on display, mostly from the late Ottoman period, follow court tastes and represent the work of court artists; according to the exhibition panels, they were evidently used and worn by people in or close to court circles. Organised on the occasion of the 35th anniversary of the Sadberk Hanım Museum, the exhibition is a tribute to the imperial splendour of the Ottomans. Until the late Ottoman period, Istanbul was one of the world’s foremost jewellery production centres. 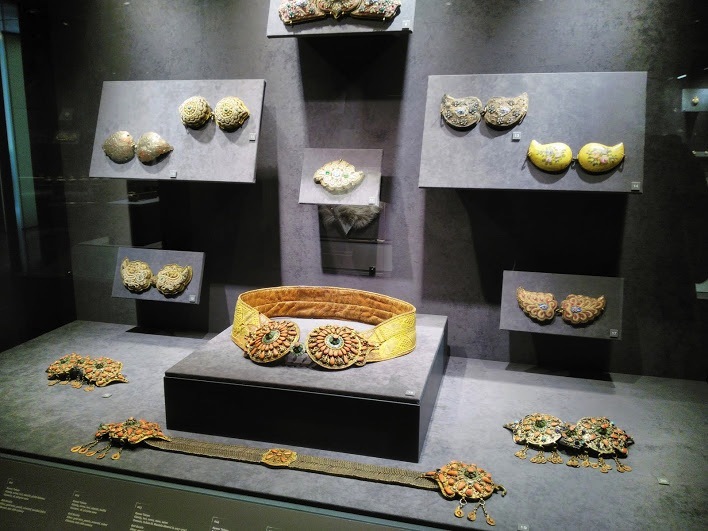 The jewellers and goldsmiths of Istanbul, both in the palace and the city, were continuing a deep-rooted tradition of jewellery-making that began with the Turkish states of Central Asia. Yet the rise in their number and output was tied to the success of the Empire. As the Ottomans became more powerful and wealthier, the palace increased its patronage of jewellers and goldsmiths, for jewelled objects were regarded as symbols of status and power. The objects featured in the exhibition are just a small sample of what was produced by these esteemed Ottoman craftsmen. From a precious-stone perspective, the 17th-century engolpion, a medallion worn by an Orthodox bishop, is marvellous. 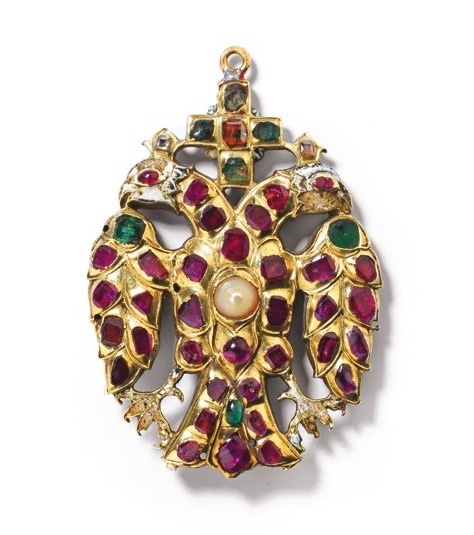 Studded with rubies, emeralds, rock crystal, spinels and pearls, the two-headed eagle gleams. 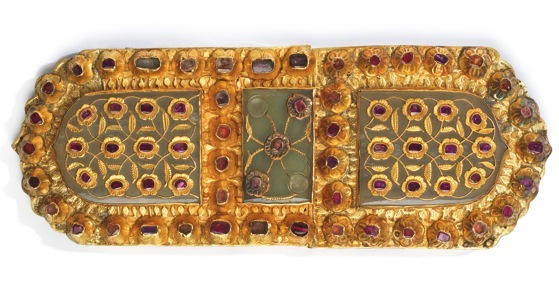 The above 16th-century gold, silver and jade belt buckle with raised spinels is equally magnificent. What is so striking about these early works is the unique shape of each stone – at that time the craftsmen didn’t have the technology required to cut stones with the precision of today’s jewellers. The irregularity makes you appreciate even more the effort that went into these creations. From the mid-18th century onwards, jewelled objects became more diverse and their use outside the palace increased. Coinciding with this proliferation was the shifting of fashion trends: traditional conventions of Ottoman art were gradually abandoned in favour of European fashions, such as the use of rose and brilliant-cut diamonds. In addition, the 19th century saw the Empire become a major market for European goods, due to political and economic concessions. 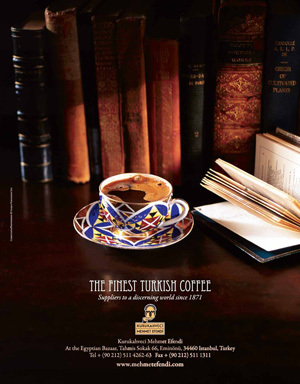 This led to an increase in European-made objects catering to Ottoman tastes. This shift is amply demonstrated in the exhibition, which mainly features objects from the 19th century. In terms of number, the enamelled and jewelled watches and snuff boxes win by a long shot. According to the exhibition panels, these were the most popular types of jewelled objects during the late Ottoman period. While European clocks and pocket watches had long been a favourite diplomatic gift, they moved beyond the confines of the palace and became popular with ordinary people after industrialisation in Europe made them affordable. 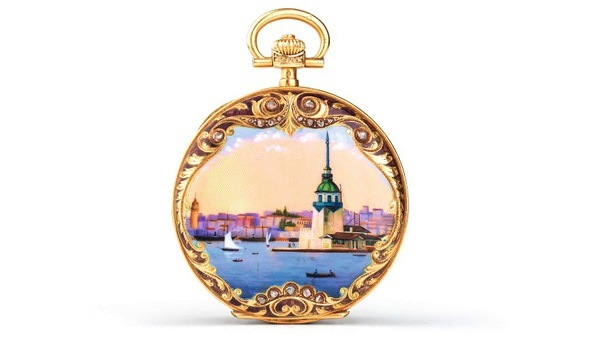 Many of the enamelled pocket waches, like the 20th-century Swiss watch pictured above, feature iconic images of Istanbul that continue to grace objects of all kinds to this day. The wide variety of jewelled and enamelled objects from the late Ottoman period is also visible in the show, which contains artefacts ranging from the above-mentioned writing box to mirrors, fans and mastic jars. Some, like the medals, broaches and coffee-cup holders, bedazzle with their gem stones, while others are more subdued, if no less beautiful. 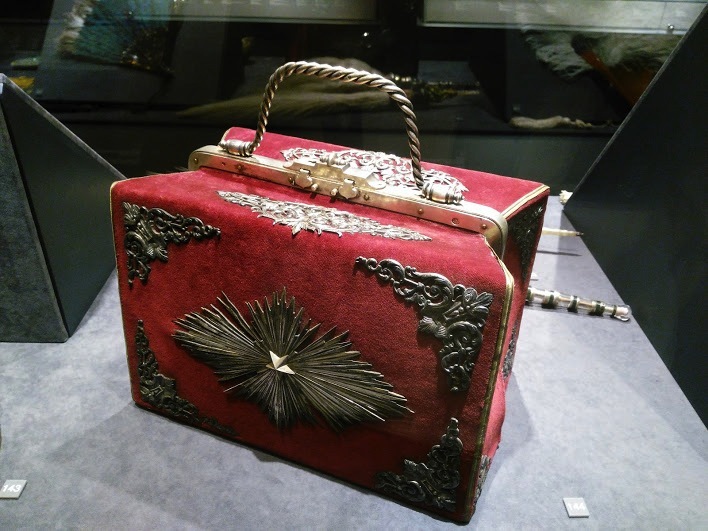 The bag that belonged to the treasurer, pictured above, is one of the latter – it may not steal the spotlight, but the intricate silver work deftly combines floral and geometric patterns. ‘Jewel’ is not a large show – it fills one floor of the annex to the old yalı. Yet the riches on display will seduce you and leave you dreaming of opulence for days to come. Plus, if you haven’t had your fill of delightful objects after touring the well-lighted, compact show, the rest of the museum is an absolute treat. I found myself spending an additional hour exploring its prized collection of antiquities and the exquisite examples of Iznik and Kütahya pottery. After enjoying more than my fill, I rested my feet at one of the tables in the back garden, trying – and failing – to pick a favourite object from the day. ‘Jewel: Enamelled and Jewelled Objects from the Sadberk Hanım Museum Collection’ has been extended to Sunday, September 25. 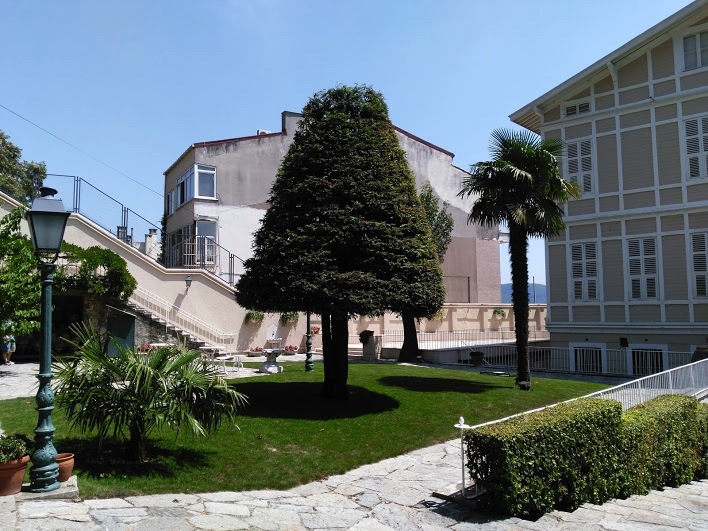 The Sadberk Hanım Museum is open daily 10.00–17.00, closed Wednesday, and can easily be reached by metro and a short taxi ride. You can purchase the exhibition book for 32 GBP from the Cornucopia bookshop.